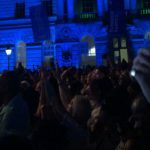 ‘Tonight, we will take a journey back to the roots and origins of reggae’, announced David Rodigan at the opening of his night with The Outlook Orchestra at Somerset House; and it was a spectacular trip through the archives of reggae as promised. The legendary DJ is celebrating 40 years of sharing his exhaustive expertise of the best reggae and ska music and the night was a perfect celebration of this. 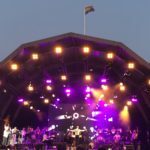 The Outlook Orchestra was conducted by the BASCA award-winning composer Tommy Evans who delivered mesmerising arrangements of some of the most iconic songs from the last 60 years. 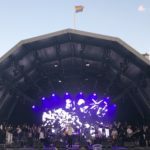 The performance was crammed with special guests from the outset, including Hollie Cook, who was also the support act for the evening, as well as Maverick Sabre, Bitty McLean, Tippa Irie and Sharlene Hector. 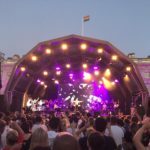 These were supported by the outstanding orchestra, in backing vocals as well as phenomenal instrumentals, and best of all, David ‘Ram Jam’ Rodigan’s captivating introduction and commentary throughout. 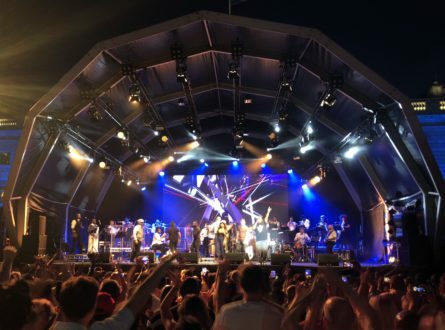 David Rodigan set and held the dazzling atmosphere and anticipation from the outset, and the expert curation of the tracks by genre and chronology galvanised the momentum of the night. Beginning in the early 1960s recording studios in Kingston, the performance opened with Simmer Down and moved seamlessly into My Boy Lollipop and Shanty Town, as the audience was guided and entertained through ska, roots rock, dance hall and all the shades of reggae your rock steady heart could wish for. 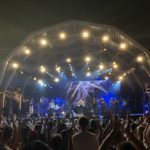 The set list of legends included artists such as Lee Perry, the Skatalites, Bob Marley and Phyllis Dillon, and songs from Sun is Shining to Satta Massagana. It was a reggae-lover’s dream from the majestic setting, the arrangement, and the outstanding talents executing this tribute to the influence of ska. The arrangement of the night was diverse and dynamic. 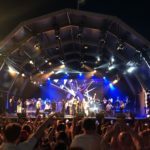 Each of the special guests brought a different style and dimension to the music, The Outlook Orchestra was sensational, and Somerset House was an extraordinary venue to experience these reggae masterpieces performed by a live, 25-piece orchestra. 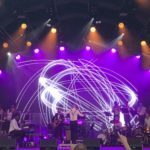 The whole evening just felt exceptionally special, the powerful atmosphere in celebration of this music was palpable from every person on the stage through to the huge crowd who was immersed in every word and every note. As David Rodigan said, ‘a new music evolved in these studios and captivated the world.’ He is absolutely part of this history of reggae, and it was an extraordinary night to celebrate that legacy that continues to captivate us. 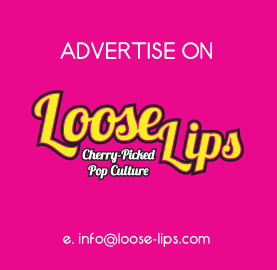 This entry was posted on Monday, July 9th, 2018 at 1:21 pm	and is filed under Events, Features, Music, Review.